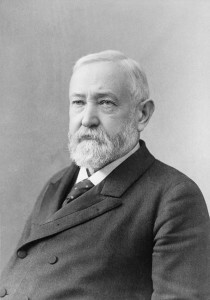 The grandson of the ninth president, the short-lived William Henry Harrison, Benjamin Harrison defeated incumbent Democrat Grover Cleveland in 1888, winning an electoral majority but losing the popular vote by a margin of more than 95,000. Harrison was man of impeccable conscience, whose moderate Republicanism moved him to sign into law the Sherman Antitrust Act of 1890, which curbed monopolies. In foreign affairs, Harrison presided over a general expansion of U.S. influence abroad. His rival Cleveland defeated him in 1892— thereby becoming the only U.S. president to serve two nonconsecutive terms.